This cauliflower salad recipe is easy to make and a nice change from your traditional potato, plus we’ve added two different types of dressings to please all taste buds. This salad is made with mayo and horseradish dressing. It’s easy to fall in love with meals we know are good for us, especially ones like this that are easy to make. 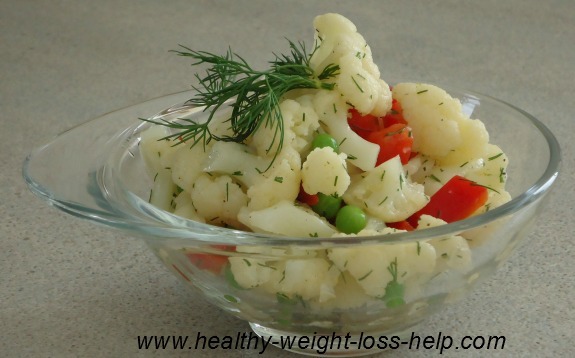 Like this healthy salad that is low in calories and fat yet offers a ton of nutrition. Cauliflower is often a forgotten vegetable at meal times and perhaps that’s because they lack a bright inviting color, but don’t let these little white cruciferous florets fool you, they pack a healthy punch when it comes to any meal you include them in. We already know this vegetable is a liver loving food that helps detoxify the body, but it is also a good source of vitamin C, vitamin K, vitamin B6, vitamin B5 and folate. They also contains potassium, manganese, protein, thiamin, riboflavin, niacin, manganese, phosphorous and is a good source of dietary fiber. Wow, that's a lot of good stuff. This salad is made with oil and vinaigrette dressing. In a pot bring water to a boil and add the cauliflower cooking them for about 4-6 minutes (or until fork tender), scoop out the florets with a strainer and place them in cold water. You can use the same boiling water and add the frozen peas to it cooking them for about 3 – 4 minutes (or whatever the instructions on the package says), remove and drain peas and also place into cold water. Once these vegetables have cooled drain well and set aside. 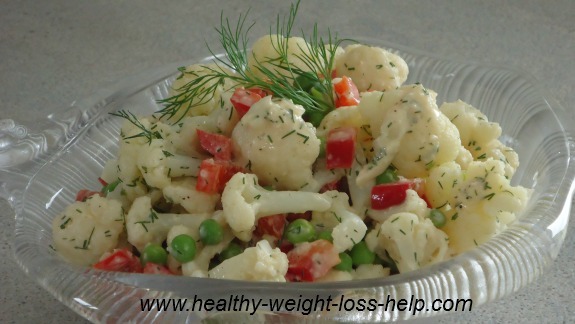 In a large bowl add the cauliflower, peas, red pepper, onions and dill. Now add the dressing of your choice to the salad and gently mix until well blended. This dressing offers an extra zing of unique flavor and horseradish has another plus, it is a liver loving condiment that adds extra antioxidants to this already healthy salad. In a small bowl mix all the ingredients well. Then add this dressing to the salad above, gently mixing it together until well blended. This choice is slightly more traditional. Both dressings are delicious giving you two different tastes.